Four hours west of Albuquerque, over the mud brown desert hills, past the impossibly expansive golden plains strewn with flat-topped mountains pressed on god’s griddle, north of Gallup, New Mexico, “The Most Patriotic Small Town in America,” in tiny Chinle, Arizona, off Indian Route 7, on a dirt-paved side street not far from where water washes down from Canyon de Chelly, nestled on a makeshift compound of small homes all occupied by members of the same extended family, inside a little white rectangular building about the size of two suburban garages, against the side wall, there’s a wood stove. Every winter morning at about 7:30 a.m., John Bahe, a stocky 47-year-old man with a dark mustache and a buzz cut, pulls up in a battered blue pickup truck and carries some freshly chopped logs inside that freezing cold un-insulated building and starts feeding them into the wood stove. He has to warm the place up by 8:00. That’s when the workout begins. This little building—half of which is a boxing ring, and the other half of which is a jumble of hanging heavy bags, and all of which has the distinct woody tang of cedar thanks to a jar of small green cedar buds that Bahe tosses onto the wood stove periodically—is the oldest and, indeed, only active boxing gym on the Navajo reservation. The Navajo reservation is larger than the state of West Virginia. You hear that there used to be a boxing team down in Fort Defiance, or maybe one might be starting up soon in Ganado, or someone remembers one way back in Window Rock, but the fact of the matter is that on America’s largest native reservation, the Damon-Bahe Boxing Gym is it. This cramped, unheated, smoky building, hardly more than a glorified shed, with a carpet and a ceiling equally worn with holes, is the epicenter of a community that stretches back half a century and whose influence extends to all corners of the Southwest. The Navajo Nation itself has had this land for 150 years. It has been fighting the whole time. John Bahe is just teaching it to keep its hands up. The Navajos (or the Diné, as they call themselves) have had, by the very dire standards of Native American tribes, relatively good fortune. They have suffered the familiar litany of historic privations: long-running wars with the neighboring Utes; encroachment from Spanish settlers; further encroachment from American settlers; a series of forced relocations in the 1860s called the Hwéeldi, or Long Walk, in which thousands were uprooted and hundreds died. But unlike most tribes, the Navajos in 1868 were able to secure a treaty granting them a reservation that contained at least a healthy chunk of their original homeland. It is an area that sprawls over the borders of Arizona, Utah, Colorado, and New Mexico, which is bounded on each corner by one of four sacred mountains—Mount Blanca in the east, San Francisco Peak in the west, Mount Hesperus in the north, and Mount Taylor in the south. Securing a reservation that was both this large and largely overlapping with the tribe’s own chosen lands was quite a coup, by the dismal standards of such things. Today, the exit leading to the sacred Mount Taylor boasts a very large Walmart. The reason that Chinle is even as large as it is is that it serves as the gateway to Canyon de Chelly, a forked and winding gorge with plunging sandstone cliffs every bit as spectacular as the Grand Canyon, that begins just at the edge of Chinle and sprawls east for nearly 20 miles. The canyon has been occupied by humans for thousands of years, and is still full of the ruins of the homes of ancient Puebloan people. In 1863, famed Western mountain man and imperialist folk hero Kit Carson marched hundreds of troops through the canyon, killing off Navajos and systematically destroying crops in order to force them to relocate, per the U.S. government’s preference. The Navajos got the last laugh. The treaty in 1868 allowed those who had been pushed out to return, the same year that Kit Carson died of an aneurysm. Today, the land surrounding the canyon is still dotted with the homes of Navajos entitled to one of the grandest backyard views in America, and the canyon floor is still planted each year with corn, squash, and other crops. Into this void strode Lee Damon, John Bahe’s great uncle. After leaving the Army, where he had been a boxing champion, Damon returned to the reservation and began teaching boxing to kids in 1960. He was the coach of John’s father, J. Cal Bahe. In 1980, Cal took over as the coach of the newly branded Damon-Bahe Boxing Team. Cal Bahe was a law enforcement officer for the US Park Service, who spent his days patrolling Canyon de Chelly. He was a burly, bearded man with a reputation for toughness, who sports dark glasses in almost every photo, even in the middle of workouts. At first, Cal trained his fighters outside, in a ring that he set up in his backyard. But 21 years ago, in a small area that held a sheep corral, he built the little gym that still stands today. Cal’s wife, Judy, a retired school social worker, lives in the house right next to the gym, and pays its light bill. The gym has no bathroom or water fountain that might generate a water bill. The boxing ring that takes up half of the gym today is the same ring that sat in Cal Bahe’s yard decades ago. Its base is a worn carpet laid over a mat. The two ropes running around the ring are made of old garden hoses wrapped heavily in tape. Ten years ago, Cal Bahe’s daughter—John’s sister—died in an auto accident. The family was devastated. Cal began drinking heavily. Going into the gym brought back too many painful memories. He lost his love for boxing. 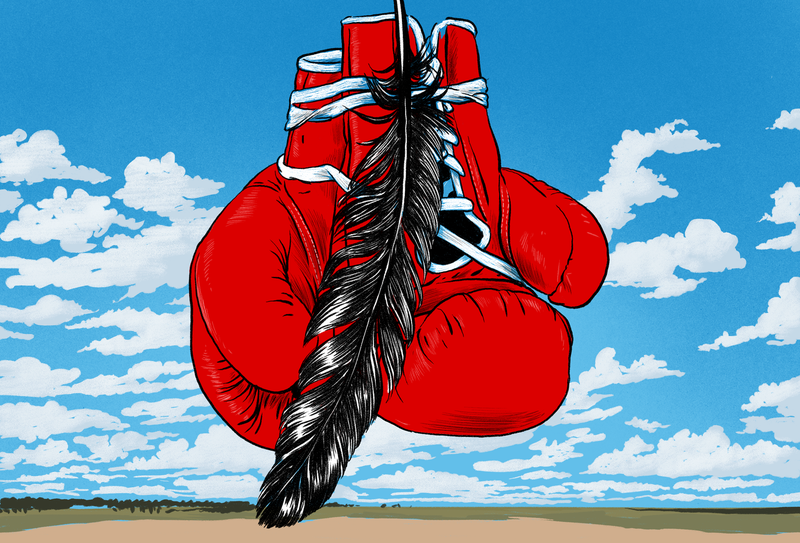 For a while, the Navajo Nation’s proudest boxing team seemed to be on the edge of dissolution. Cal had taught his children to box, but all of them had drifted away from the sport as they grew up. John Bahe had a successful amateur boxing career, fighting up until his mid-20s, but was working as an electrician and construction worker by the time Cal gave up on the gym. It was a steady job with good pay. John had a family of his own, living down the road from Chinle in Del Muerte, off the northern branch of the canyon. He did not have any particular desire to become a boxing coach. But there was no one else in the family particularly suited or available for the job. He noticed that when his family was having dinner next door to the gym, small gaggles of kids would wander up and ask, “Hey, you having practice tonight?” A 50-year family legacy was on the line. It gnawed at him. So, slowly but surely, John Bahe walked away from his steady job to get the gym running again. Before he knew it, he was the third generation of his family to be in charge of the Damon-Bahe Boxing Gym. For the past eight years, he has been a full-time unpaid boxing coach—which is to say he is a full-time unpaid boxing coach and personal trainer and community center administrator and psychiatrist and motivational speaker and wood chopper and maintenance man and CEO of an always-shifting group of young and old people from Chinle and its surrounding areas who are drawn to the gym for salvation of one kind or another. He is also a wedding DJ, available for hire. John Bahe told me this story on a Monday night in February while he was simultaneously running a practice with more than a dozen people, ranging from decorated competitive amateur fighters to small seven-year-old girls in candy-colored socks who giggled constantly. All were moving around en masse inside the impossibly crowded gym. As he was talking, a large piece of insulation fell from a hole in the ceiling into the middle of the ring. John calmly hauled out a ladder and fixed it and kept talking. He is fundamentally an easygoing man. (Unlike his father, who was winning bar fights right to the end.) Most days of the week he runs two practices: an hour-long practice in the morning, and a two-hours-plus-long practice in the evening. The morning draws more of a beginner crowd—people who just want to get a nice sweat before work—but some particularly committed people show up for both. Everything is free of charge. John’s assistant coach is his wife Elvina, a strong, placid, dark-haired woman who works days at the local Holiday Inn, enabling her to sometimes secure the corporate discount rate on a room when the team is driving hundreds of miles to some tournament or other. Elvina’s mother, Elsie Cly, often stops by to watch and cheer people on. The intensity of boxing does not impress Elsie, who grew up herding sheep inside Canyon de Chelly and who has hiked its entire 17-mile length just for fun and who spent years waking up at 3 A.M. to hitchhike to work in town because she didn’t have a car. “My dad taught me, this is life—it’s hard!” she says. She now serves as a canyon guide for tourists, despite being 67 and a grandmother many times over. Cal Bahe passed away in 2015, but his wife Judy still lives next door, frequently dropping by practice and serving as the social worker that she was for kids who come to the gym to escape serious problems outside it. Judy, like many others, was pulled into boxing’s orbit by the sheer gravitas of Cal’s personality, and eventually became a judge for fights. After Cal died, she would sometimes come into the gym when it was empty and cry. But now she is sitting in on practices once again. She never stopped paying the light bill. Lowell Bahe, John’s younger brother, was the family’s most decorated amateur boxer, winning multiple national titles as a teenager. His story was so picture perfect that it inspired the 2004 movie Black Cloud, starring, among others, Tim McGraw, and written and directed by Ricky Schroeder of Silver Spoons. Today, John’s star fighters are two of his own kids: James, who already has 90 amateur fights before his 16th birthday, and Mariah, 14, who has dreams of going to the Olympics in 2024. Those dreams seem legitimate. She is 85 pounds of pure, focused energy and aggression, ranked first in the USA in her division. Out of the ring she is a smiling teenager with a wide, toothy smile and a dark brown ponytail hanging far down her back. Inside the gym, she transforms into a maniacal athlete. It is not uncommon for her to lead entire practices herself, and then spar, and then continue working out after everyone else has finished. In her spare time, she runs. One reason she’s so sharp is that she spars with her older brother, who is already a polished, talented fighter in his own right, and who is also significantly larger than her. (“I usually get her frustrated to the point that she wants to cry,” James says, with the classic older brother smirk.) Her fighting nickname is “Princess,” and her dad has made up very attractive T-shirts that read “TEAM PRINCESS” across the back shoulders to wear at tournaments. She has 35 amateur fights. It is clear that she has the perhaps-insane drive of aspiring champions. “It makes me feel different from all the other people,” she says. “I just love it so much.” Sometimes she has to go to Kansas City or Pocatello, Idaho, to get fights. It is difficult for her to find a wide variety of other 85-pound girls on her level in the Southwestern region, for some reason. Just about every weeknight, John Bahe and his wife and various family members and his fighting son and daughter (often joined by an older son, Jeremiah, a veteran at age 21) crowd into the gym along with 10 to 15 other people to work out. Parents sit on stools by the front door, watching. Bahe makes up every day’s workout on the fly. Every workout is a little different. Every night is intense. Somehow, each workout manages to perfectly exhaust both the competitive fighters and the seven-year-olds and the thirtysomething guys wandering back into the gym after some years off, without quite making anyone pass out. It’s a neat trick. Boxing has been many things to the Bahe clan, and to the people of the Navajo reservation who find their way into the gym. It has been a unifying force, a life raft, a healthcare plan, and a form of therapy. But it has not been a money maker. The Damon-Bahe gym has produced multiple generations of amateur champions, but none of them have gone on to professional fame and fortune. Most were competitive during their teenage years, then fell away from the sport, with a handful trickling back in later in life just to get in shape. The only pro fighter that John could think of that came out of his gym was Preston Draper, a Chinle local who can be seen on YouTube sparring with John a decade ago, when John was about 80 pounds heavier. Draper went pro in 2001. He lost his first five fights, all in small shows in the southwest. In April of 2008, in Grand Junction, Colorado, he finally won his first fight. The next month, he was stabbed to death by his brother at home in Chinle. Even if you are a good boxer, it is not easy to go pro from the reservation. You have to drive long hours to get to any big venues. You’re not in a position to promote yourself and draw big crowds. Your fan base is mostly poor and far away from anywhere you might fight. The money never works. If John Bahe and his talented brothers had grown up in New York City they certainly might have gone pro, but as it was, just keeping the gym open was struggle enough. John’s grandparents lent the gym financial support, and now his stepmom does. He himself quit his job for the gym, and coaches for free, and goes out and chops the wood, and, when the gym is empty, sometimes builds doghouses in there to sell for extra cash. Any donations that come in on their website go directly to food and gas and travel costs to take kids to tournaments. Elvina Bahe works long days at the Holiday Inn to support both her family and the boxing team. “We get kids that are so angry sometimes,” Elvina says. Even though they know that many kids will disappear after a few weeks, they also know that a few might not. They do all of this because they want to, and because they have to. There is no salary to be had. Last year, John says, the local government supported him with $130. There is one impressive building in Chinle. It is the high school basketball arena, known as the “Wildcat Den.” The gleaming, sunken stadium seats 7,500 people, well over the entire city’s population, and features a media section, snack bars, and a team store. It was build 10 years ago at a cost of $32 million. It sits next to an equally lovely aquatic center that has an Olympic-sized pool and a well-equipped weight room. It is certainly a wonderful resource for the one thousand students of Chinle High. But you have to wonder what John Bahe might have been able to accomplish with even one percent of that money. The single most striking place in Canyon de Chelly—possibly on the entire Navajo reservation—is Spider Rock, two side-by-side spires of towering red standstone that rise more than 800 feet off the canyon floor like twin skyscrapers. Off the main road around the rim there is a short trail leading to an overlook, where you can stand on the lip of the canyon and look out at the grand, uneven towers jutting up from the snow-sprinkled canyon floor. As I stood there, first one, then three, then 10, then many dozens of black shapes glided out from the cliff walls below and began circling slowly upwards. Ravens, hulking and shiny and black, riding a column of air, starting hundreds of feet below and then soaring up to eye level and then past, until a great black cloud of them massed overhead, corkscrewing in tight circles higher and higher into the sky. And when they had become just tiny black dots far above, the circling stopped, and they suddenly dispersed in all different directions, to each point of the map, until they were eaten by the blue horizon. They had found a way out.